Mupirocin is an antibiotic ointment used for the treatment of canine bacterial infections of the skin. These skin infections can include superficial pyoderma, caused by susceptible strains of Staphylococcus aureus and Staphylococcus intermedius. Mupirocin requires a prescription from your veterinarian. 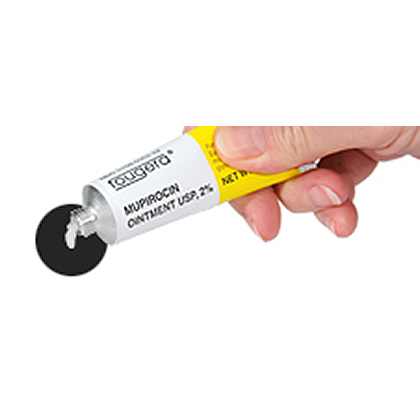 Mupirocin is an antimicrobial agent that inhibits the growth of gram-positive and gram-negative bacteria. Mupirocin ointment should not be used for more than 30 days. Mupirocin Ointment is FDA approved for treating topical infections in dogs caused by susceptible strains of bacteria. Use this medication for the full amount of time prescribed by your veterinarian. Your pet's symptoms may improve before the infection is completely healed. Avoid getting this medication in the pet's eyes, nose, or mouth. 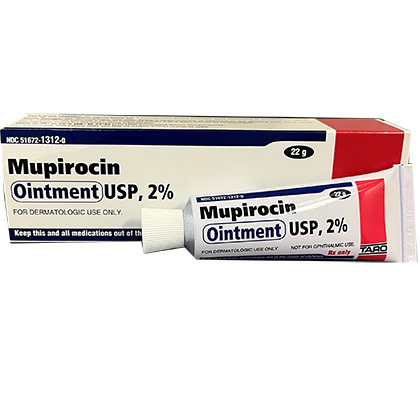 Mupirocin Ointment is available by prescription as 2% strength in a 22 gm tube. The usual dose of Mupirocin Ointment is to apply on the dog 2 times a day. Mupirocin Ointment is an antibiotic medication used on dogs which treats bacterial infections such as pyoderma and abscesses. Mupirocin Ointment may also be used for purposes other than those listed. Tell your veterinarian if your pet has had an allergic reaction to Mupirocin Ointment in the past. The safe use in pregnant or breeding animals has not been determined. Apply the missed dose as soon as you remember. However, if it is almost time for the next regularly scheduled dose, skip the missed dose and apply the next one as directed. Do not use a double dose unless directed to by your veterinarian. An overdose of Mupirocin Ointment is unlikely to occur. If an overdose is suspected, seek emergency veterinary medical treatment. Because of the potential hazard of nephrotoxicity due to the polyethylene glycol content of the product base, care should be exercised when using this product in treating extensive deep lesions where absorption of large quantities of polyethylene glycol is possible. Side effects are rare. If a skin reaction such as irritation should occur, treatment should be stopped and your veterinarian should be contacted. Side effects other than those listed may occur. Talk to your veterinarian about any side effect that seems unusual or bothersome to the animal. Avoid applying other topical medications at the same time unless told to by the veterinarian. Other topical medications may affect the absorption or effectiveness of Mupirocin Ointment. Your pharmacist has additional information about Mupirocin Ointment for health professionals that you may read. Call your veterinarian for medical advice about any side effects to your pet. You may report side effects to the FDA at 1-800-FDA-1088. Apply Mupirocin to the affected area two times a day. Do not use on cats. Avoid getting this medication in the pet's eyes, nose, or mouth. Use this medication for the full amount of time prescribed by your veterinarian, even if your pet appears to be better. Symptoms may improve before the infection is completely healed. Apply to the affected area 2 times a day. Store this product at room temperature.